Casino Heroes is a whole new format of online casino. It is a closed RPG-world where you travel to different islands, completing tasks and defeating zombies. Hero Gaming Limited and Hero Island N.V.
China, France, Guadeloupe, Hong Kong, USA Martinique, Reunion, etc. 5. Casino Heroes – prank, scam or fair casino? This interesting project has united a large audience from Europe and the Far East. But in Russia it remains relatively unknown. So what is it – a big provocation or a legally qualified establishment? Is Casino Heroes a scam or a respectable casino? Let’s find out right away. The platform was designed in 2014, and the operator managed to receive its first license in 2015. Therefore, some sources get confused, indicating the year of its creation. Nevertheless, Hero Gaming Limited and Hero Island N.V., which, by the way, also owns Betser Casino, did their best: this is really a well-designed, informative and fascinating casino. 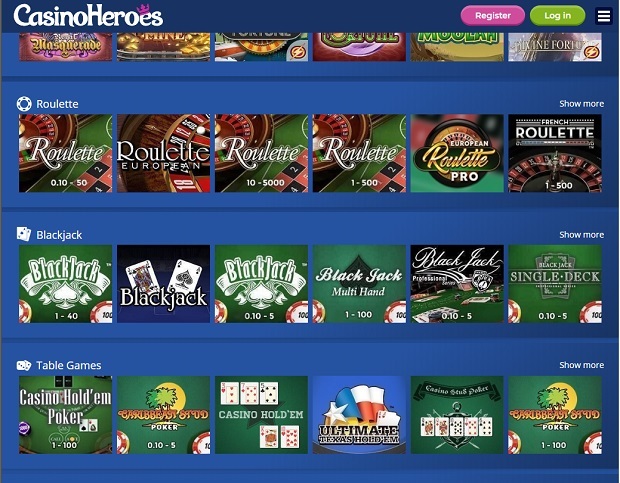 Casino Heroes is adapted to different types of devices, browsers and screen resolutions. Pages load quickly (especially given the presence of various graphic elements), the elements do not “overlap” each other. There are only 6 language versions: Swedish, Norwegian, German, Finnish, English, and Chinese. So it is obvious that the platform is not intended for the CIS countries and Russia. And, although these countries are not included in the list of unauthorized users, it is impossible to indicate them during registration. The security of users on the website is ensured by the anti-virus system. All the transactions are conducted over a SSL security protocol. In addition, Casino Heroes collaborates with human rights organizations (BeGambleAware, etc.) and organizations that fight against ludomania. The official website of the casino is designed in the style of role-based battles: an unobtrusive dark blue background, a map of “battles”, interesting characters and a lot of tooltips simulating training of a real RPG game. The user “travels” to the islands that are opened by betting. In addition to the island map, there is a standard game lobby. It is traditionally divided into blocks of categories, and at the top there are several similar tabs: Slots, Blitz Games, Live Casino (temporarily inactive), Jackpot Games, Roulette, Blackjacks, Table Games. There is also a search box if you want to select a particular game by its name. The collection contains more than 1,100 game titles, but quite a few categories: slots, card (Blackjack, Poker, Baccarat) and table games (Roulette, Scratch). For some reason, live products are temporarily unavailable. The menu is very short and almost doesn’t provide any information about bonuses, program of accumulation of the game currency (rubies) and replenishment/withdrawal methods. On the plus side, all the detailed information on licenses and documents regulating legal relations is available in the footer. From the first seconds, the website impresses you with its unusual design, and therefore a certain scantiness of the functionality can be forgiven. The mobile version of Casino Heroes was also launched in 2015. This application for Android devices (from version 4.0) and iOS (from version 6 and higher) is significantly inferior to the browser version in terms of the number of games: there are only a few dozen of them. Apart from this, the formats are similar: both in the number of bonuses and in the game progress strategy. The mobile menu is more succinct: all the information of the footer is united with the main sections in a small list that can be quickly scrolled through. The version is quickly installable (like most mobile casinos), and the registration takes about a minute (the time indicated by the operator is 34 seconds, however you need to wait for the SMS with the confirmation code; but we’ll tell you about this). The profile is adapted to the mobile devices, so there are no problems with small buttons or unreadable text. It is a good application, which lacks only the diversity of the game collection. No downloadable version is offered by Casino Heroes. Currently, all the services are obliged to be mobile and independent from physical locations, so an old-fashioned PC-agent can rarely be found in the modern gambling world. At the same time, no one denies the advantages of a PC agent: none of the other versions can boast of the possibility to build such good graphics (you can unpack additional files on the computer that won’t affect performance, as in a browser or smartphone) and independence from the provider blockings (if it is not authorized to use a certain casino in your country, it will be problematic to download it even from Google Play/App Store, whereas the offline agent will remain intact). In addition, the mobile version requests access to all data on your device, whereas when playing on a PC, you keep your privacy. Unfortunately, the Casino Heroes live zone is temporarily unavailable. You can only play board/card games in the video format. At the same time, a live casino is popular among users and usually brings the greatest income to an establishment (only tournaments can compete with this area and then not in all cases). It is to be hoped that the operator will resolve the situation and we will be able to enjoy “Live” Poker, Roulette, Baccarat and Blackjack. Casino Heroes cooperates with a small list of trusted developers beloved by users: NetEnt, Microgaming, Play’n’GO, Betsoft Gaming, Rabcat, Yggdrasil Gaming, Push Gaming, Playson, Evolution Gaming, NYX. 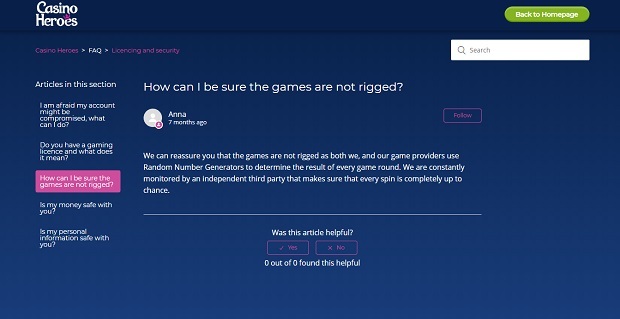 Speaking about the software of the above-mentioned developers, first of all, it is worth noting the unbiased random number generators, which have been verified many times by regulators and specialized organizations. In addition, the studios impose strict bureaucratic criteria for partners. Cumulatively, all of this creates a good impression of the provider. It won’t take muсh time to register at Casino Heroes, but the user must specify and confirm a lot of personal data. In the first step, you need to enter your e-mail, name and password (there are a number of requirements that will appear as tooltips when you complete the fields). Next, you need to specify your residence address (along with the postal code – according to it, the system verifies whether the location of your device and the entered address data match). In the third step, you need to comfirm your mobile number: an SMS with a 16-digit access code will be sent to the phone. Upon successful completion of all these steps, you finally have your personal account. Everything is simple here: information about the current account (real currency, game currency: rubies), crediting/debiting history, data to be adjusted, connected/available bonuses and deposit services. By clicking on the logotype, you can move to the game lobby, and by clicking on the profile icon, you will again go to the profile. The most interesting part of the casino’s bonus program is undoubtedly the accumulative system. The start package is also not bad, but it offers strict wagering conditions. There are other interesting bonus offers. Except that the promotional codes are no longer valid at Casino Heroes. Let’s consider each category of promotions separately. Casino Heroes doesn’t offer no deposit bonuses. We believe that it’s all about the provider’s desire to avoid the flow of fraudulent withdrawal requests. The thing is that such actions “tempt” dishonest users to get funds on the account, and then to try to withdraw them, even without wagering. Bonus for the first deposit: 100% (up to €50) + 50 free spins (10 х 5 days). Bonus for the second deposit: 100% (up to €50). 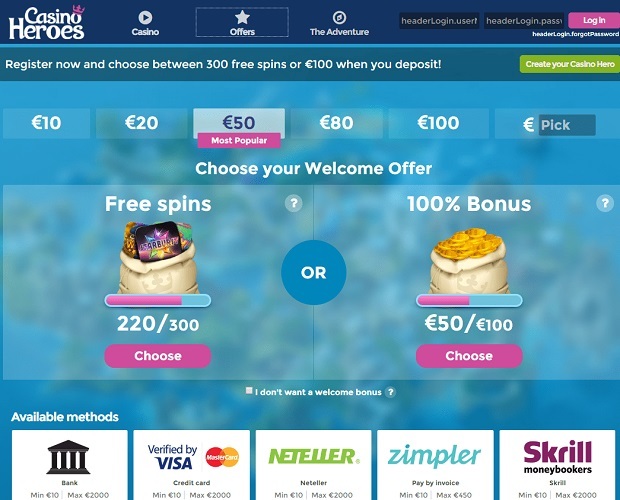 Bonus for the second deposit of more than €50: 75 free spins for Swirly Spin Slot. A wager for all of three bonuses is x40. Wagering time depends on the gift: for free spins it is 30 days, for cashback – 60. Casino Heroes has introduced an interesting bonus currency accumulation system – rubies. They are awarded for defeating bosses in quests, trips, victories in tournaments and replenishment of an account: 1 ruby is given for a €75 bet. The administration places the prize currency in the “chest”. If it is not wagered, it can be “lost”. 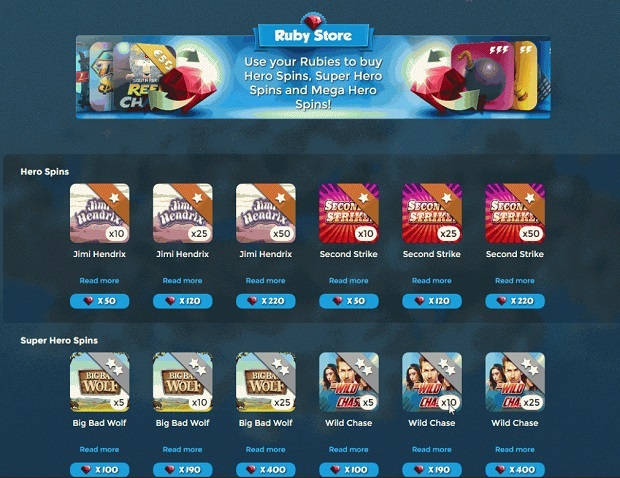 After wagering (with the same x40 wager, as in all other promotions offered by the casino), rubies go to the account of the client who can exchange them for real currency or spend on prizes in the Ruby Store. 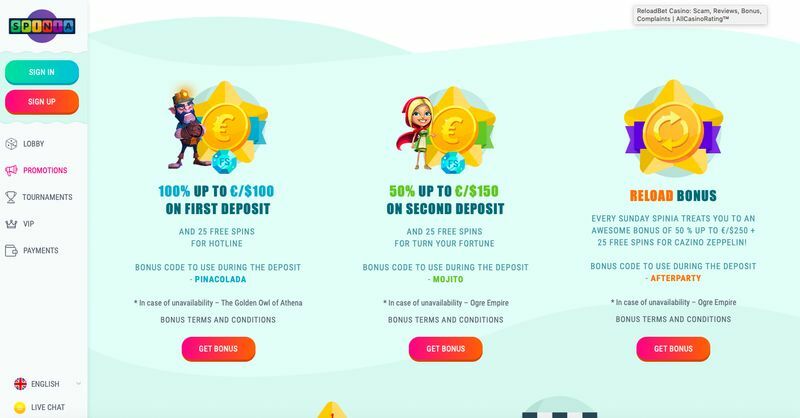 They are free spins credited for each replenishment of the account, depending on the amount: 25 free spins are given for making a deposit of €10–19, 60 free spins for a deposit of €20–29, and so on. The wager is the same: x40. And the period during which the player must fulfill the conditions of the promotion so that the bets are not lost is also 30 days. It is important to know: in the process of betting, funds are debited primarily from a personal account, and only then – from the game one. Accordingly, if you don’t wager your bonuses you will incur losses from your own funds. They are quests to the countries and islands marked on the map. Most often, this is a one-week promo. Prize pools can reach up to 15,000,000 euros. In addition, there are traditional tournaments with the progressive jackpot slots. We have not found any VIP program from Casino Heroes. Obviously, it is “replaced” by the bonus point accumulation system, which encourages users to be active. A significant disadvantage of the casino lies in the fact that you can use only one currency: euros. In principle, the choice of this monetary unit is explained by the fact that the casino focuses primarily on players from Europe. However, it is not always convenient. In addition, residents of the Far Eastern regions who may register on the website (the Chinese, for example) will be forced to pay a conversion fee. As for the replenishment and withdrawal methods, everything is somewhat better here. You can deposit money in several ways: VISA/MasterCard, Neteller, PugglePay, Skrill, Trustly, Zimpler, EcoPayz, Neteller, bank transfer. The minimum amount is 20 euros. The funds are credited to the account instantly, and the welcome bonus of Casino Heroes is credited immediately afterwards (if you have not refused it). You can use VISA/MasterCard, Bank Wire Transfer, Neteller and Skrill to withdraw your funds. The timeframes of the transaction depend on the selected service and can reach up to 5 business days, not counting the time for processing the request by the administration. Feedback about Casino Heroes shutters a beautiful image created when considering the concept, design and functionality of the website. Many users refer to issues with payments in this casino: standard refusals to withdraw funds or even ignoring the client, a long verification procedure that does not lead to anything in the end, and even situations when the funds sent by the client are not credited to the account (even in the presence of bank statements, the support service refuses to admit an error on its part). In general, the service at the casino turned out to be a disappointment for the majority of clients who expressed their opinions online. Hero Gaming Limited has obtained licenses of three different regulators: Malta Gaming Authority (the company’s registration number – C61794), Government of Curacao (sublicense number 8048/JAZ2015-004) and United Kingdom Gambling Commission (license number – 000-048300-R-326623- 001). This indicates the desire of the provider to play fair and responsibility towards the players. However, for the sake of completeness, we should also read the Service User Agreement, which reflects the main details of the legal relationship between the player and the casino management. As we have mentioned above, the comments about Casino Heroes contain a lot of criticism. In addition to groundless, from the point of view of clients, refusals in payments, the work of the client support service, which can ignore the client or respond with standard phrases (users even suspect that these are robot-generated answers), is causing discontent. If you face an injustice, as a client of Casino Heroes, you must first write to the casino technical support. There is no special box for submitting claims against the casino, therefore you should send your letter to the main email address: support@casinoheroes.com. We do not recommend that you leave a request in the chat, as it has no legal force. It can take up to 2 weeks to consider your claim – these are standard terms for any provider. If after this period your situation is still not resolved, it makes sense to leave a request on the Malta Gaming Association’s website (in a special section) or contact one of human rights organizations: for example, ODR. In the first case, you will receive the response immediately. In the second case, you will have to wait up to 5 hours (at least, this time is indicated by the administration when you send a letter). Of course, we are talking about standard complaints, and not complaints, which, as mentioned above, are considered up to 2 weeks. Terms and Conditions (User Agreement) contains a number of paragraphs that all players should know. After all, their non-observance may lead to loss of funds, and to account blocking. Let’s consider some of them. The user is responsible for entering correct personal data. And if the data provided by you are incorrect (it does not matter if you made a typo or intentionally misrepresented the information), the administration may regard this as a violation of rights and block the account. Therefore, we recommend taking seriously the registration procedure. If you are suspected of fraud, an account can be blocked without prior notice. Usually, the reasons for this are unverified data, documents that are difficult to identify or user actions in the game (using strategies, for example). Casino Heroes payment managers are entitled to conduct additional payout verification procedures. Consequently, if you win more than 1,000 euros, you will need to provide copies of your passport, utility bills or other supporting documents. Inactive and dormant accounts are the profiles that have not been accessed for a specific period of time. In the first case it is 12 months, in the second case – 3 months. If you have not accessed your account during this period of time, then upon prior notice (and if you have ignored it), the administration assigns it the appropriate status and starts charging an account maintenance fee in the amount of €5 per month. When you activate your account, you can, of course, return this money, but only if you prove that you could not log in to your personal account for objective reasons (no Internet connection, health problems), and not by forgetfulness/negligence. In other cases, the money will be charged until the balance is reset. 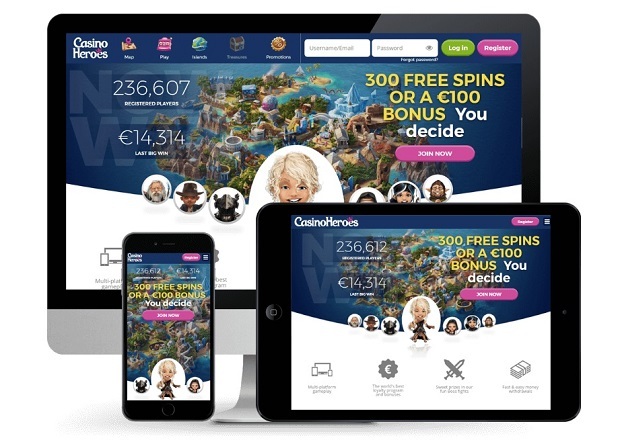 This section states: by registering on the website/in the application of Casino Heroes, you assume all the risks; any possible losses (direct or indirect) incurred by you cannot be presented as a claim against the casino. This includes technical failures, account hacking, and human errors. Moreover: even in case of successful consideration of your complaint against the casino by third parties (say, MGA); the maximum amount of compensation set by the provider is 100 euros. Therefore, we recommend that you are prepared for difficulties in obtaining your winning, if you decide to use the services of this casino. Casino Heroes – prank, scam or fair casino? Casino Heroes has left a dual impression. On the one hand, there is a great concept, interesting games, a diverse bonus policy. And its compliance with the chosen position commands respect: the establishment is open mainly for European countries, and its functionality corresponds to this orientation. In addition, Casino Heroes has no problems with the license, and human rights organizations are on the list of its partners. It would seem that the casino respects its clients. But numerous reviews and comments on the Web indicate the opposite: players are ignored, they are often denied payments and are subject to strict requirements. 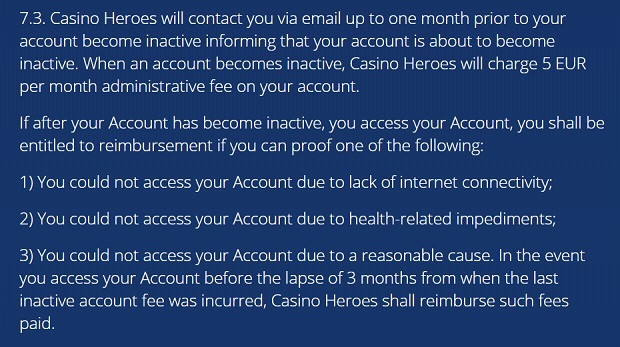 And the User Agreement practically leaves no chance of achieving justice: its acceptance (and you cannot refuse to accept it when registering your account at Casino Heroes) removes all responsibility for your losses from the operator. Of course, Casino Heroes is not a scam, but we recommend using services with caution and only after reading all the documentation. Casino Heroes is a bright and ambitious project. However, its colorful and adventurous atmosphere hides disrespect for people using the services of this establishment. Is it possible to win at Casino Heroes? It’s up to you to decide. However, we are definitely not including it in the list of recommendations.